Chefs behind Dog Haus share dishes with "GMA" from sponsor King's Hawaiian. Spice up your barbecue with these Hawaiian-inspired recipes for Hawaiian Foods Week. "GMA" and our sponsor, King's Hawaiian, had chefs Ilan Hall and Adam Gertler, the duo behind the craft casual hot dog spot Dog Haus, make their signature Huli-Huli chicken and pork sausage and lava chicken schnitzel sandwich. Huli-Huli chicken and pork sausage topped with King's Hawaiian Sweet Island Ginger Sauce, bouillonnaise, pineapple and jalapeño relish, crispy fried onions and scallions. 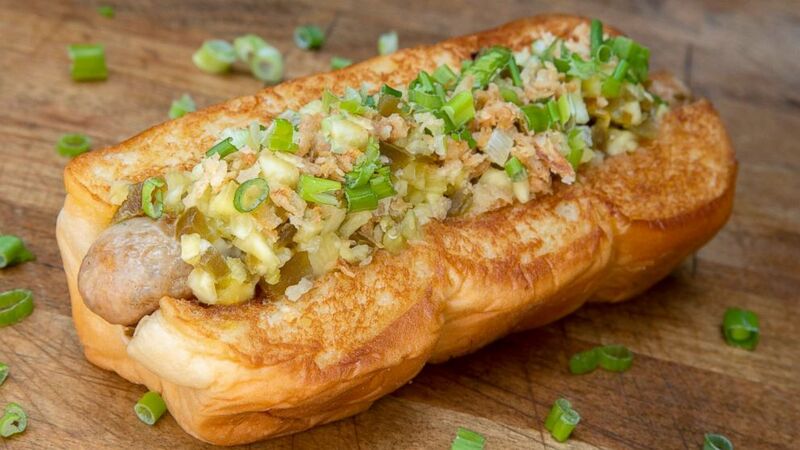 (Dog Haus) A Huli-Huli chicken and pork sausage topped with King's Hawaiian Sweet Island Ginger Sauce, bouillonnaise, pineapple and jalapeno relish, crispy fried onions and scallions. 1. Mix the bouillon and water in a small pan/pot until dissolved. 2. Place the mix over a medium flame, stirring often. Wait until the mixture begins to bubble. 3. Remove from heat and pour into the mixing bowl. 4. Add one (1) cup of mayo and whisk. 5. Add one (1) more cup of mayo and whisk again. 6. Add one (1) more cup of mayo and whisk again. 7. Place boullonnaise into a standard squeeze bottle, label and refrigerate. 1. Cut off the top and bottom of the pineapple. 2. Stand the pineapple upright and shave off the remaining corner edges of skin. 3. Cut into half-inch planks. 4. Dice the planks into quarter-inch to 3/8-inch cubes for relish. 5. Use a scale to weigh the pineapple in a mixing bowl. 6. Divide that weight in half and use that number to weigh the jalapeños separately. 7. After the jalapeños have been weighed, dice them into quarter-inch to 3/8-inch cubes for relish. 8. Mix the pineapple and jalapeños together well. 9. Cover and wrap tightly, label, refrigerate and marinade for 12 hours. 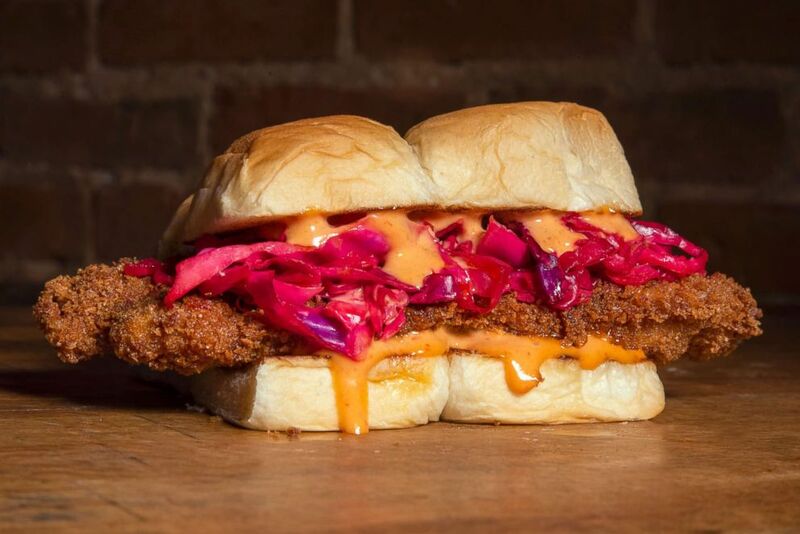 (Dog Haus) A chicken Schnitzel topped with Big Island Lava mayo, pickled red cabbage and chili oil. Schnitzel'd chicken topped with Big Island Lava mayo, pickled red cabbage and chile oil. Season chicken with salt. Dredge in flour, egg wash and breadcrumbs. Mix equal amounts of lava sauce and mayo. Toast rolls with melted butter. Deep fry chicken at 350 degrees until golden brown. Squeeze lime over the chicken. Season chicken with chili oil generously. Spread mayo mix on both sides of roll. Build sandwich with chicken and pickled cabbage. Bring all ingredients to a boil. Let cool. Gently strain over cabbage. Let steep overnight and stay forever.